Italy refuses entry to PFLP terrorist Leila Khaled, who tried to hijack an El Al flight in 1970. 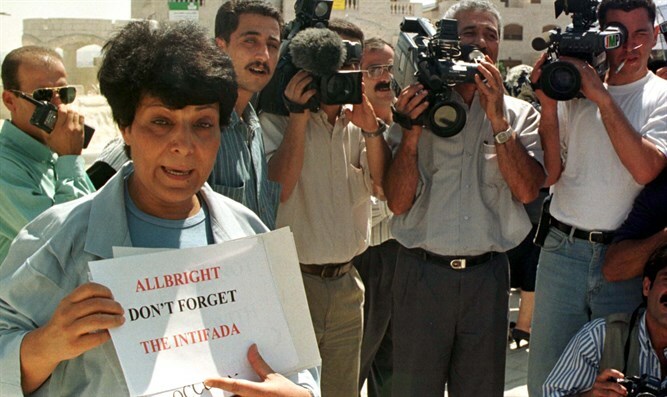 Italy on Wednesday refused entry to Popular Front for the Liberation of Palestine (PFLP) terrorist Leila Khaled, Haaretz reported, citing the Italian press. Khaled was stopped by Italian border police in Rome after she disembarked a flight from Amman. She was expected in the Italian capital as well as in the southern city of Naples to give talks on the 50th anniversary of the foundation of the PFLP, but was sent back to Amman, according to the report. Italy’s Department of Public Security issued a statement insisting that the stopping of Khaled was a purely administrative act, not a political decision. “The Jordanian citizen arrived to Rome from Amman without a valid Schengen visa [allowing passage through European borders], and was sent back in compliance with national and international Schengen regulations,” the statement read. Khaled was arrested by Israeli sky marshals in 1970 with two grenades as she was attempting to hijack an El Al flight from Amsterdam with a partner, whom the security officers killed. British authorities released her in exchange for hostages from another hijacking a month after her arrest. “We should welcome in Italy all Palestinians who are willing to discuss the creation of a state next to Israel, not those who advocate the creation of a state instead of Israel, like the terrorist Khaled,” he added. Khaled set off controversy in September when she took part in an event at the European Parliament in Brussels titled “The Role of Women in the Palestinian Popular Resistance.” The event was organized by far-left Spanish MEPs. Just last week, the President of the EU Parliament Antonio Tajani announced that representatives of terrorist organizations or former terrorists would no longer be allowed to participate in events in parliament.